I was thrilled today to make use of Google’s ability to search by a photo instead of text. The museum recently received an antique child-sized mannequin from Chuck Bullock. 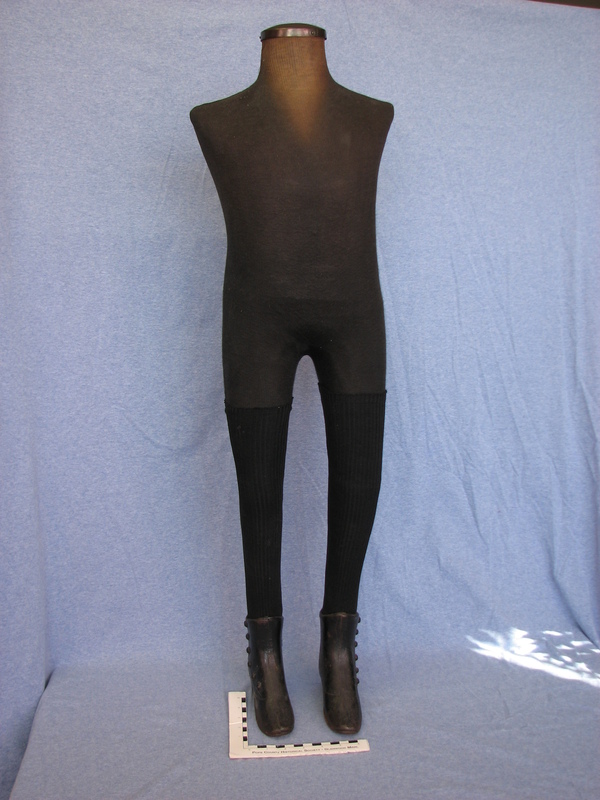 The mannequin was found in the basement of Johnson & Bullock men’s clothing store – it was there from previous owners of the building. It is a great addition to our collection and will be used to display some of our vintage clothing. It is just perfect for clothing display as there are no arms or stands to fight with. The bottom of the mannequin is weighted down by heavy metal shoes. This one is a size 6 and is a match to the size 4 mannequin given by the Bullocks years ago. As usual when we receive new items, I did a Google search to find more information. In this case, I was mostly trying to find the approximate date the mannequin was made. Sadly, “vintage mannequin” and “antique mannequin” did not find anything like the one from Mr. Bullock. BUT – when I uploaded a photograph of the mannequin along with the key words, I found a site with photos of a similar mannequin from the 1850s! It is doubtful that ours is that old as there were no shops in Glenwood in the 1850s, but it gives me a rough idea that our mannequin is from the mid to late 1800s. I think Google image search will become a valuable research tool for me in the future as I encounter “mystery” objects or don’t know the correct keyword to use for searches. It is great how modern technology can help us learn about the past! After digging further in our own files, we found that the building that housed Johnson & Bullock’s store was built by Monroe Zalkind in 1917. It was always used as a clothing store. The mannequin in question then must have come to Glenwood some time after 1917. Sam Zelken owned a men’s clothing store from 1917 to 1933. In 1969 it was sold to Victor Johnson and Charles Bullock who owned the store until Vic’s death in 1996. This entry was posted in Collection Notes and tagged antique mannequin, Charles Bullock, Chuck Bullock, collection research, google photo search, Johnson & Bullock, mannequin, Pope County History, Pope County Museum, technology, vintage mannequin. Bookmark the permalink. I found a garment bag in my mothers attic that may or may not be vintage. It’s says its from Johnson and Bullocks in Glenwood. Just curious.. It is vintage in that the company has been closed for years, but it isn’t terribly rare. We have one of their garment bags in our collection to document the store. It was an important part of Glenwood for many years. Ok. Thanks for the info! My mom wants to put in in her garage sale but wanted some info in case it is of value to someone.